When I was a Freshman in college, my professor played scenes from Do The Right Thing in order to have a conversation about how we discuss and portray race in entertainment. When we got to the riot at the end of the film, a young black woman in the class began to laugh. My white professor asked her what was so funny about it–he seemed almost offended that she would laugh at such a pivotal, serious moment in the film. She tried her best to explain what was amusing about it but it was difficult for her to get it across. I understood why she laughed though and I’m guessing the rest of the black students in that class got it too. 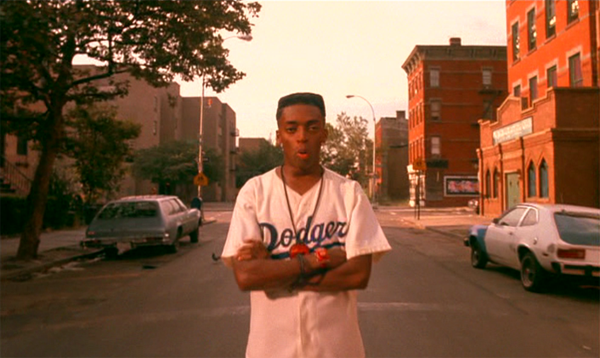 Do The Right Thing is Spike Lee’s third film, and it feels like the film Spike Lee has been building to for his entire film career up until that point. 25 years later, it would be nice to look back on it as dated but instead it’s just as relevant today (even the style of it is relevant today). The only thing that’s really changed is its reverence. Today we can watch Do The Right Thing and see it as a landmark film that was deserving of its accolades and maybe even deserving of more; we can appreciate the murkiness of the story and its ability to never judge its characters. However, when it came out in 1989, it wrecked the nerves of critics who thought so lowly of black people that they assumed the film would make them riot. It aggravated people because of its lack of definite answers or opinions. As far as people were concerned, what good is a conversation on race if no answers are given, and judging by the Hollywood reception of a film like Crash, this attitude hasn’t gone away. Do The Right Thing follows Mookie, a young black man living in an African-American neighborhood in Bedford-Stuyvesant, Brooklyn with his sister and delivering pizzas for Sal’s pizzeria working to support his girlfriend Tina and their son Hector. The film takes place over the course of the hottest day in years and finds itself capturing the regular activities of a distinct group of characters around the neighborhood. There’s an old drunk called Da Mayor who’s constantly trying to win the approval and affection of the neighborhood matron, Mother Sister; there’s Radio Raheem who walks around the block blasting Public Enemy’s “Fight the Power” on his boombox. There’s the local radio disc jockey, “Mister Señor Love Daddy”; Three men, known as “the Corner Men,” who comment on the neighborhood and the day’s events, Four teenagers – Cee, Punchy, Ahmad and Ella – dealing with the heat outside and Buggin’ Out, an Afrocentric activist who takes on the cause of demanding Sal recognizes black heroes on his wall of fame. As the heat builds up throughout the entire film so does patience and comfort. One of the more fascinating aspects about Do The Right Thing is what it implies about how we deal with each other. A good majority of the movie involves people holding their tongue and keeping disapproval to themselves. The best example of this is when Mookie’s sister, Jade, comes to the pizzeria. Sal is obviously taken by Jade, and they have a flirtatious relationship with each other that rubs both Mookie and Sal’s oldest son, Pino, the wrong way. But nothing is ever said, it’s simply felt and implied. People are uncomfortable with each other for various reasons but nothing is typically said because it goes against etiquette. The heat acts as the universe pushing people into ultimate confrontation; without it, silence keeps the peace. Speaking of Radio Raheem, his blasting of “Fight The Power” is thread that carries the film. Public Enemy’s song about revolution is angry, confrontational and unapologetic. It’s a song about the buildup to a point where you can’t take it anymore and you have to react. Much of Do The Right Thing travels the line between angry and indifferent. There’s a lot of anger stored inside these people; a lot of feelings about poverty, gentrification, culture, ownership and relationships. When Radio Raheem talks about Love vs Hate or “the left hand and the right hand”, you know it’s a metaphor for race relations, but the thing about it is: how do you choose love when there is none. To say that these people all hate each other would be inaccurate, but it would be fair to say they don’t particularly love each other and they do hate their circumstances. So when all was said and done, what choice was left in the end but hate. In the climactic moment, Buggin Out and Radio Raheem and their cohorts burst into Sal’s around closing time, blasting Public Enemy and screaming at the top of their lungs to “put some brothers on the wall”. This leads to Sal in the heat of the moment, getting angry and unleashing every thought he’d probably kept to himself many times before and destroying Raheem’s boombox. They get into a scuffle afterwards which leads to the police showing up to arrest and beat Buggin Out and inadvertantly beating Radio Raheem to death in front of a mostly black crowd. The anger with which this event instills in people causes Mookie to grab a trash can and throw it into the window of Sal’s while proclaiming “hate”. Typically, in entertainment and media in general, black people are encouraged to take the high road. We’re always supposed to be the bigger people. We’re always supposed to choose love. So to have the film climax with such an ugly and aggressive moment as this was always going to upset a certain type of audience who’d rather not think too deeply. People tend to obsess over whether or not Mookie or Buggin Out or Raheem were heroes of this story; hey want to know whether these were the guys who “did the right thing”. I am sometimes curious as to whether or not the point would’ve been more clear if Spike Lee were white or, at the very least, if he weren’t Spike Lee. The idea that Lee could be objective was never a consideration, there had to be a clear sign. Despite these criticisms, it’s hard for even the most minimal thinking person to say that one group was right and the other was wrong. It’s too neat and tidy and undermines the power of the scene. So much emotion and ferocity is poured out on that screen and all of it is gripping and fascinating to watch. By the time the cops show up you knew where it was going because this is where it always “happens” to go. You knew something bad was going to happen and for them to watch a young man die from police abuse due to this was heartbreaking and frustrating. In the end, the crowd chooses hate because what else were they really going to do. When I was a kid and I got angry at my parents, I would go into my room and destroy everything–because it was my room. I knew I could get away with it more than if I destroyed what belonged to them. This, in essence, is what the riot is. The reason Buggin Out wants pictures of black celebrities on the wall is because they have just as much right to be represented on the wall as the Italian celebrities. Sal may own that pizzeria but it’s in a black neighborhood and prospers from black dollars, in a sense they look at it as their’, so when they burn it down, they’re burning down a part of their neighborhood not just Sal’s Pizzeria. Reasonably speaking, they could get away with it. The day after, Mookie goes to visit a distraught Sal at his burned down restaurant to ask for his pay for the week. Sal is livid that he could throw a garbage can into his shop and just act like it’s no big deal. They fuss and fuss until Sal angrily pays Mookie and the two briefly and, a little unclearly, seem to reconcile. It’s an odd moment because it lessens the riot from something seemingly revolutionary to something much more mundane. It’s reduced to something that just happens. That girl in my class laughed because this is something that just happens. I got that and I’m sure others did. It’s not exactly true and it ignores a history of white supremacists rioting in black neighborhoods and homes, but it’s a stereotype among a list of many that have been burdened on us and at a certain point, laughter is how you deal. I didn’t find her reaction wrong anymore than I found any of the things that transpired wrong. It just happened. Lee felt that people wanted him to solve racism in his movie which was unfair. Racism is not a concrete idea; it’s deep, engrossing and informs everything. It deserved to be treated as complicated. A mentally disabled man named Smiley meanders around the neighborhood, holding up hand-colored pictures of Malcolm X and Martin Luther King, Jr. and pointing out that they were friends. The film ends with quotes by both men about violence on two opposite spectrums. They didn’t agree with each other’s worldviews but they were friends; they chose love. If there’s a lesson in Do The Right Thing it revolves around that choice between love and hate, but it’s a decision that’s constantly being made not one that will ever be finalized.